Social workers have a variety of roles in health care settings. Often they become part of interdisciplinary health care teams in outpatient clinics associated with academic institutions that have a medical school component. Social workers often demonstrate and apply a complex skillset that complements other treatment providers and enhances coordination of patient care. The University of North Texas Health Science Center at Fort Worth is a prime example of an interdisciplinary setting. It has academic (Texas College of Osteopathic Medicine) and clinical (Patient Care Center) facilities, which are complementary. Generally, internal medicine physicians who specialize in geriatric medicine provide direct patient care in an outpatient ambulatory clinic. Medical students and fellows (physicians spending additional time in school to specialize in specific areas of medicine) rotate through most clinics as they are completing their academic program and preparing for residencies. Faculties, including social workers, participate in medical education. Interdisciplinary geriatric teams may consist of geriatricians, internal medicine physicians, neuropsychologists, geriatric psychiatrists, neurologists, geriatric cardiologists, geriatric social workers, geriatric nurse practitioners, geriatric nurses (registered nurses and licensed vocational nurses), ophthalmologists, urologists, audiologists, physical therapists, pharmacists, and medical assistants. Specialists not based onsite usually have a designated day to see patients in the clinic. Geriatric programs are designed to assess and treat patients and assist them in maintaining maximum independence and quality of life as they age. A patient’s living environment, functional level, and safety are major considerations when creating treatment plans and goals. • team members focus on healthy aging for their patients as well as maintenance of dignity and quality of life. Through use of a medical home model with geriatricians in a leadership position, the social worker’s role is integrated with other disciplines and is somewhat flexible. Professional activities overlap with and support team efforts. In a sense, social workers are a pivotal point for patients’ experience from the time of initial contact throughout their future clinic visits. Social workers are direct care providers, patient advocates, and liaisons with other geriatric team members. The assessment and identification of problem areas along with support needs is ongoing from the initial visit, as is the planning for long term care needs. Social workers often set the stage for open communication in a patient-centered atmosphere. Caregivers are recognized as an integral part of the treatment team and encouraged to share their viewpoints on patient needs and problem areas. Social workers often use their skills to establish trust and build rapport; conduct in-depth, meaningful assessments; and provide brief solution-focused counseling. Sensitivity to cultural diversity, patient advocacy, and adherence to the ethical standards of practice, employed on a consistent and regular basis, are all part of the NASW Code of Ethics and are closely aligned with standards of medical professionals. Social workers routinely augment services of other professionals on the team. For example, physicians often review social assessments prior to meeting a patient or request a social worker’s assistance in identifying problem areas and resources to develop a treatment plan. Given such details as marital status, household composition, lifestyle, support system, functional level, and cognitive status, they can better understand patients within the context of their current living environment. Knowing patient circumstances, the reason for the assessment, and patient/family concerns in advance helps individualize the geriatric assessment and results in more effective use of face-to-face time with the patient and family members. A common aspect of geriatric assessment teams is a specialty in dementia diagnosis and treatment. The importance of a comprehensive physical exam—including diagnostics such as lab, MRI/CT scan, or bone density scan as well as evaluation of medication management issues—is widely recognized as part of the process of ruling out physical causes for dementia. Medications are evaluated to assess possible side effects of drug interactions and identify medication management issues such as polypharmacy, lack of adherence to instructions for taking medications, lack of understanding, or limitations in access to medication. Social workers contribute to this process through assessment questions targeting problem areas. Social workers often participate in administering such diagnostic tools as the Mini-Mental State Exam or the Montreal Cognitive Assessment. In addition, screening for depression using the 15- or 30-point Geriatric Depression Scale is frequently included to rule out depression as a possible cause for dementia symptoms. Sometimes a psychiatric evaluation is included. Neurocognitive screening or testing generally done by a neurologist or neuropsychologist provides additional information for making a dementia diagnosis. A typical format for communication between the patient, caregivers, and the health care team is a family summary conference or care conference, which is done after a thorough physical exam, and results of all diagnostics, including neurocognitive testing, are available. This meeting is usually attended by physicians, neuropsychologists, social workers, and sometimes nurse practitioners who talk with the patient and family members directly (or by conference call if unable to attend) to review findings and allow the patient and family members to weigh in. Patients are given a written summary of the assessment, which includes recommendations for treatment and follow-up and educational and resource information from social workers related to diagnosis and plan of care. Literature—about dementia, caregiver respite (at home, a care facility, or an adult day care center), housing options, managing communication and behavior problems, understanding driving restrictions, home safety, and caregiver stress reduction—is commonly provided. Another aspect of social worker services involves counseling with caregivers, educating them, and providing ongoing support as they face challenges in caring for a person who has dementia. This is most often done in a clinic, although it’s sometimes scheduled on a different day to allow caregivers to come alone. Local Alzheimer’s associations offer additional education and support groups and frequently collaborate to support caregivers. Geriatricians, nurse practitioners, and nurses often rely on social workers to reduce barriers to patient care and facilitate achievement of patient care plan goals. Social workers provide links to community resources for transportation, financial assistance, housing relocation, and companion/sitter services to match need for changing levels of care. In addition, social workers encourage open lines of communication with the health care team, model a proactive interdisciplinary team approach to problem-solving, guide family members as they struggle with caregiving challenges, facilitate advance care planning, provide brief emotional support counseling as issues of patient well-being and safety arise, and promote coordination of family member roles. Social workers also reenforce health care team recommendations with patients and family members concerning the importance of organizing systems for medication and financial management, taking precautions to ensure patient safety and implementation of routines, which include a variety of activities as well as social interaction. Some geriatric programs include community outreach as an extension of patient care. Social workers are part of interdisciplinary health care teams, which include a physician/medical director, physician assistants, nurse practitioners, nurses, physical therapists, pharmacists, and medical assistants. Team members make home visits to at-risk patients, particularly if they were recently discharged from a hospital to a private residence, an assisted living facility, or an independent senior living facility. The goal is continuity of care, timely follow-up, and prevention of rehospitalization. As educators, social workers are present not only in the clinic and the community, but also in the classroom. Social workers are mentors for medical students (as well as nurse practitioners, physician assistants, physical therapists, and public health students) rotating through the clinic, preparing them for interaction with patients and family members by briefing them on social history and current patient issues. 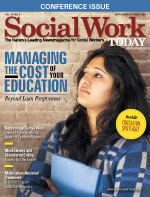 Social workers often model for students who observe them interviewing patients, administering mental status or depression scales, and communicating with patients or family members. Social workers assist with didactics through classroom presentation to medical students on Medicare, Medicaid, levels of care, and community resources. They also observe, instruct, critique, and grade students as they role-play physician-patient interactions in the classroom. As the need for medical social workers increases, consistent with the rising percentage of older adults in the population, it is likely there will be an even broader application of social work skills in medical, academic, and community outreach settings through use of the interdisciplinary team concept. — Kathleen Holzaepfel, MSSW, LCSW, CSW-G, CMC, is part of the interdisciplinary health care team in the internal medicine/geriatrics department at the University of North Texas Health Science Center in Fort Worth, Texas.